Craps is considered to be one of the classic casino games, an essential component of any casino that takes itself seriously. If you’ve ever been to Vegas, or to any brick-and-mortar casino, you’ll surely have fond memories of the exciting atmosphere surrounding an active craps table. Craps is especially fun when a “shooter” is on a hot streak. It’s one of those great spotlight moments where everyone is rooting you on to win big. At online casinos, craps has found its place as a popular choice amongst players. In this article we’ll be going over some of the basics of the game as well as providing some recommendations for the best sites for playing craps. 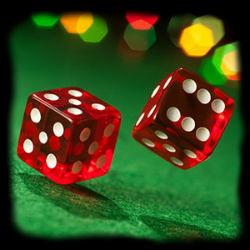 Unlike in roulette where the wheel is spun by the “house”, in craps the players control the random element by rolling a pair of dice. The player rolling the dice is known as the “shooter”. Before each roll the other players place bets on what they predict the outcome of the next dice throw will be. As the shooter, your first roll is known as the “come-out throw” and determines how the rest of your turn will play out. Before you make this throw, players can place bets on the “Pass Line” or the “Don’t Pass Bar”. These areas are clearly marked on the craps table. you bet on the “Pass Line” and the sum of the dice is 7 or 11. You bet on the “Don’t Pass Bar” and the sum of the dice is 2, 3, or 12 (also known as “craps” sums). On the “come-out throw”, any other results become known as the “Point”. Bets that are placed on the “Pass Line” are now actually aimed at the current “Point”. From here on, the table is open, meaning that players can also place bets on the other areas of the table which include a variety of combinations and sums. if the “Point” is thrown, you win if your bet was placed on the “Pass Line” and the shooter continues with another “come-out throw”. If a 7 is thrown, all the bets on the table are collected and the dice are passed to the next player in line. Aces / Snakes Eyes – a bet that the next roll will be the total sum of 2. Big Red – refers to the number 7. Players won’t usually say “7” at a craps table. Marker – a plastic disc used to mark the current “Point”. World bet – a single roll bet that’s split on the numbers 2, 3, 11 and 12. Yo / Yo-leven – said instead of 11 so that players don’t confuse it with 7. Casinos can be very loud places. It’s good to know that some of the wagers that you can make at a craps table will have a lower house edge than what many other table games can offer you. This gives you a great advantage to breaking even or even coming out on top at the end of a casino session, at least when compared with other games. Still, the main reason to play craps is just the fun of the game. It’s really fast-paced and when you’re on a hot streak, it can be an amazing feeling. The best way to have success at the craps table is to play the “Pass Line” bet, which was explained above, and then play the various odds. In terms of your chances, this is the safest strategy. While other bets on the craps table have odds that are not so bad, some should really be avoided! Bets on the “Big 6” or “Big 8” have a house edge of 9.1%. Bets on “Hard 4” or “Hard 8” should also be avoided as their odds give a house edge of over 11%. Ouch! Once you’ve picked out a craps game, just start playing online to get a feel for the game. The bankroll won’t be real money, just a representation. You can play craps for free this way for as long as you like. Once you feel that you get how the game works, just look for a button in the game window that says something like “Join”, “Sign up” or “Cashier”. You’ll be taken to a new screen and asked to register. These days signing up at online casinos is a breeze. Stick to our recommended sites so that your information is kept safe. Craps is one of the all-time classic casino games. If you’re not familiar with this game then you should definitely give it a try. Online craps is great since you don’t have to wait your turn. You are always the shooter and that means that the action never stops. Many of the online casinos that we recommend also offer craps as a mobile version which is great. The odds offered by online craps games are often much higher than that offered at land-based casinos which is amazing since you can win much more for your bets. Good luck at the craps table!